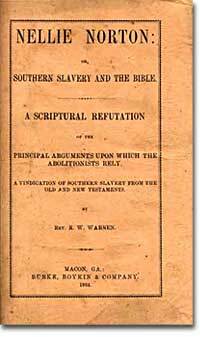 Southern slaveholders often used biblical passages to justify slavery. Defenders of slavery argued that the sudden end to the slave economy would have had a profound and killing economic impact in the South where reliance on slave labor was the foundation of their economy. The cotton economy would collapse. The tobacco crop would dry in the fields. Rice would cease being profitable. Defenders of slavery argued that if all the slaves were freed, there would be widespread unemployment and chaos. This would lead to uprisings, bloodshed, and anarchy. They pointed to the mob's "rule of terror" during the French Revolution and argued for the continuation of the status quo, which was providing for affluence and stability for the slaveholding class and for all free people who enjoyed the bounty of the slave society. 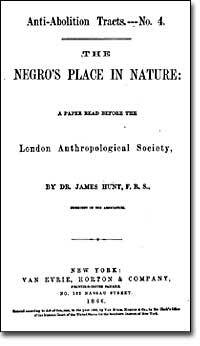 Some slaveholders believed that African Americans were biologically inferior to their masters. During the 1800s, this arguement was taken quite seriously, even in scientific circles. Defenders of slavery argued that slavery had existed throughout history and was the natural state of mankind. The Greeks had slaves, the Romans had slaves, and the English had slavery until very recently. Defenders of slavery noted that in the Bible, Abraham had slaves. They point to the Ten Commandments, noting that "Thou shalt not covet thy neighbor's house, ... nor his manservant, nor his maidservant." In the New Testament, Paul returned a runaway slave, Philemon, to his master, and, although slavery was widespread throughout the Roman world, Jesus never spoke out against it. Defenders of slavery turned to the courts, who had ruled, with the Dred Scott Decision, that all blacks — not just slaves — had no legal standing as persons in our courts — they were property, and the Constitution protected slave-holders' rights to their property. Defenders of slavery argued that the institution was divine, and that it brought Christianity to the heathen from across the ocean. Slavery was, according to this argument, a good thing for the enslaved. John C. Calhoun said, "Never before has the black race of Central Africa, from the dawn of history to the present day, attained a condition so civilized and so improved, not only physically, but morally and intellectually." Defenders of slavery argued that by comparison with the poor of Europe and the workers in the Northern states, that slaves were better cared for. They said that their owners would protect and assist them when they were sick and aged, unlike those who, once fired from their work, were left to fend helplessly for themselves. James Thornwell, a minister, wrote in 1860, "The parties in this conflict are not merely Abolitionists and slaveholders, they are Atheists, Socialists, Communists, Red Republicans, Jacobins on the one side and the friends of order and regulated freedom on the other." 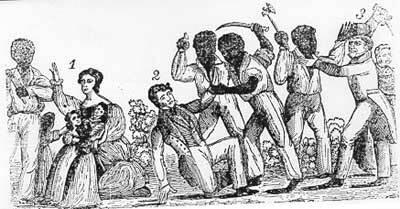 The violence of Nat Turner's 1831 slave revolt frightened many southern slaveholders. Such unrest was used by many as a reason to continue slavery. When a society forms around any institution, as the South did around slavery, it will formulate a set of arguments to support it. The Southerners held ever firmer to their arguments as the political tensions in the country drew us ever closer to the Civil War. What invention led to the increased concentration of slavery in the South? Which of the following was not included in the Slave Codes? Which of the following was valued by men in the Southern aristocracy? What is the term for a master setting a slave free? 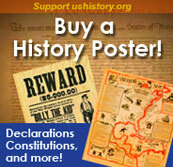 Which two men led slave revolts during the 1800s? Which of the following was not a Southern argument in favor of slavery? A book review of Larry Tise's Proslavery: A History of The Defense of Slavery In America. Though this review is rather short, it does present some of the startling reasoning used to justify slavery, including the perceived approbation of slavery found in the Bible. George Fitzhugh's two books advocating slavery helped polarize Northerners and Southerners on the issue of slavery. Fitzhugh maintained that all labor is essentially slavery and that the "slavery" of free workers is more cruel than the complete slavery of blacks. There are links to electronic versions of his books. The American Memory program at the Library of Congress ensures that we don't forget our nations past — the good and the bad. This list of linked articles, pamphlets, and books leads to an extensive variety of justifications for slavery. Read the words of contemporary Southern slaveholders to see why they thought slavery was right. How did a Southerner feel about daily life with slaves? How did would one feel about a violent revolt? You can find out in their own words. South Carolina's Information Highway has provided a list of links from folks down in Dixie before the Civil War. Find out first-hand what they thought of slavery here. How did southerners justify slavery? Read these 19th- century pamphlets to find out first-hand.